As egg freezing is lifted from the experimental phase and becoming more mainstream, many women are choosing to preserve their fertility and delay motherhood. Shana undergoes egg freezing at age 38 because recently starting her own business from the ground up coincides with the rest of her reproductive years. 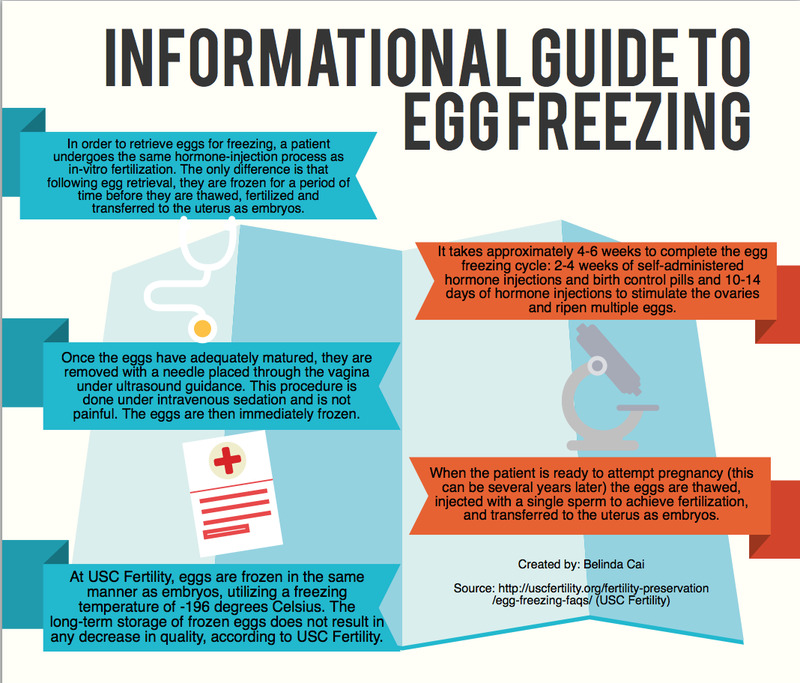 Various women, doctors and an embryologist discuss the logistics of egg freezing. In an era of women taking over high-achieving jobs and surpassing men in obtaining advanced degrees, motherhood sometimes takes a backseat. According to the Centers for Disease Control and Prevention, the first birth rates of women 35 years and older has increased more than fivefold since 1970. There are certainly ways for women to balance the work-family life, but many are looking to delay fertility in light of the new technology available. Women are turning to oocyte cryopreservation, or egg freezing, as a solution. The American Society for Reproductive Medicine (ASRM) declared egg freezing no longer experimental in 2012 due to a new technology used called vitrification, "which is almost like a flash-freezing of the eggs," according to Cris Karl, senior embryologist at West Coast Fertility. The eggs go on the tip of a vitri-straw vessel and are enclosed and dunked into liquid nitrogen to be frozen. Egg freezing recently made the front page of news sites and peoples’ social media feeds when companies like Apple and Facebook declared that they would offer it as a benefit to female employees. 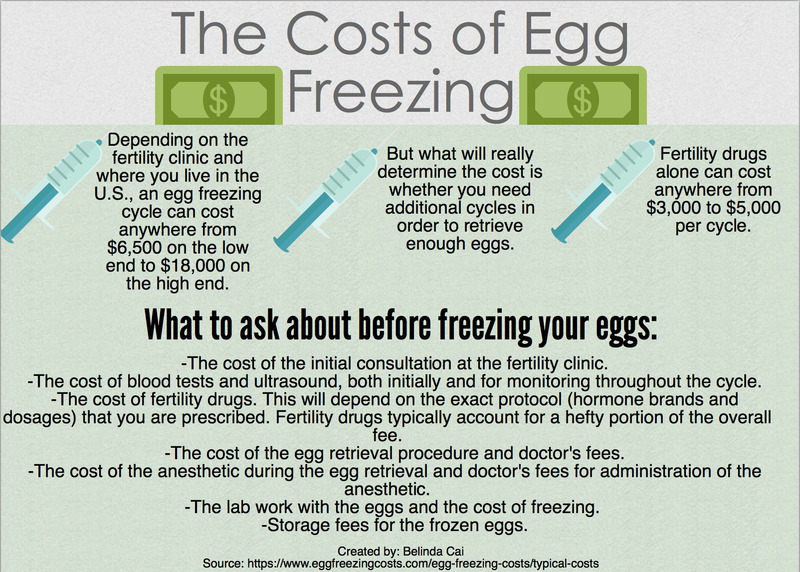 With egg freezing becoming increasingly mainstream, it makes sense that more and more women are opting to get it done. Shana, a recent University of Southern California MBA graduate and entrepreneur, is 38 years old and in the second round of the procedure. This means she went through the process once and is going through it a second time to get more eggs frozen. She had the procedure done at West Coast Fertility Center, and says that egg freezing really gave her a piece of mind. She can stop worrying about when and if she wants kids and focus on her business, Top That Chocolate, which is a full-time endeavor. This made the procedure – hefty cost and recovery period included – worth it to her. Shana explains that her family and friends, and especially her boyfriend, were all very supportive of her decision to get this done. In fact, many of her friends became interested in freezing their eggs upon learning that Shana had done it. She had her eggs frozen in 2013, but says that it confused her family and friends because she’s not a planner and lives in the moment. They didn’t understand why someone like her would undergo a procedure that focuses on the future and planning. “But, actually being a non-planner was inspiration to keep doors open so I could prepare for any eventuality,” Janesick explains. "I do think that… women, especially now, especially if you’re in a large city where we are, are delaying having children. It’s an option a lot more women are choosing." She says she notices how much people change with each decade. She has no desire to have kids now, but her attitude might completely change 10 years from now. Allie Marshall, an educator and non-profit executive, recently gave birth to a child because of preserving her eggs; she had her eggs frozen when she was 35 years old in 2007. She says that if she could do the procedure again, she would do two rounds of eggs. "I had one shot and we got lucky," she says. "[My baby] is two months old." Dr. Kelly Baek is a board-certified endocrinologist at California Fertility Partners who has worked with many women with both conceiving and preserving their fertility. Baek notes that the average cost of the procedure varies from patient to patient because of the fertility medication involved, but is not cheap. She thinks that it becomes more financially possible for women to get their eggs frozen when their companies provide egg freezing as a benefit. “When companies are paying for it, it definitely makes it more feasible for patients because often times it’s really expensive and unless parents pitch in, it’s really hard to get it done when you’re younger,” Baek explains. Janesick saw the procedure as financially possible, but this was because her parents paid for it when she defended her PhD last September. Shana, on the other hand, put the costs on a zero interest credit card. Marshall paid for the whole procedure by paying for about a third upfront and taking the rest out in loans. Dr. David Diaz is the medical director of West Coast Fertility Center and Global Donor Egg Bank. He agrees with Baek that companies offering it as a benefit to employees is a positive scenario. Diaz says it’s quite a generous offer from those companies and he doesn’t believe they are requiring or mandating that anyone be forced to freeze their oocytes. However, Diaz wants to reinforce that the procedure is not an “insurance policy” or a 100 percent guarantee that a woman will be able to conceive down the road. Marshall says that despite this "chance," which was 51 percent in her case, it was worth it. She was able to have a baby, and says the only thing she would've done differently is frozen two rounds of eggs. "There's a chance with everything," she says. "You can get pregnant naturally and [have] it not work out. I've had that happen." Both Diaz and Baek note that a woman’s pregnancy rate is determined by the age of the egg. Ideal candidates are in their twenties or early thirties. There is little data on live birth in women over the age of 40 who freeze their eggs. When you’re under the age of 35, 50 percent of your eggs are chromosomally abnormal, but this percentage is much higher in women over 40. Thus, the pregnancy rates are lower and the miscarriage rates are higher. Despite this, women in their forties still opt to get it done and see it as a chance they’re willing to take, according to Baek. Shana, who is two years shy of 40, knew that the procedure isn’t a 100 guarantee but is still glad that she did it. “[Freezing my eggs] really freed a lot of head space for me to just pour everything I have into the business and not worry about whether I’m missing my only opportunity to have a baby,” she says.